Br J Gen Pract 2007; 57 (545): 971-978. Background GPs' adherence to clinical practice guidelines is variable. Barriers to guideline implementation have been identified but qualitative studies have not been synthesised to explore what underpins these attitudes. Aim To explore and synthesise qualitative research on GPs' attitudes to and experiences with clinical practice guidelines. 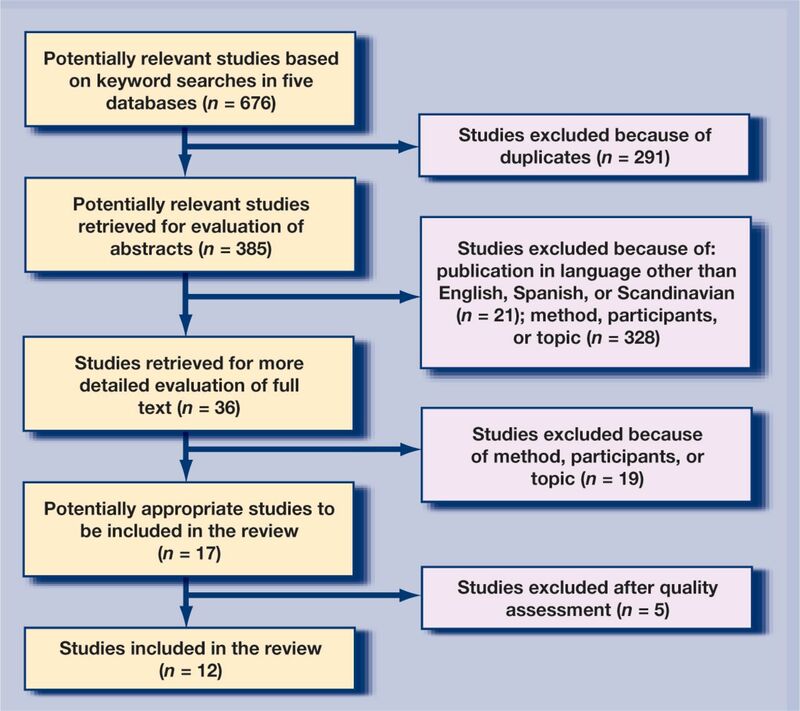 Design of study Systematic review and meta-synthesis of qualitative studies. Method PubMed, CINAHL, EMBASE, Social Science Citation Index, and Science Citation Index were used as data sources, and independent data extraction was carried out. Discrepancies were resolved by consensus. Initial thematic analysis was conducted, followed by interpretative synthesis. Results Seventeen studies met the inclusion criteria. Five were excluded following quality appraisal. Twelve papers were synthesised which reported research in the UK, US, Canada, and the Netherlands, and covered different clinical guideline topics. Six themes were identified: questioning the guidelines, GPs' experience, preserving the doctor–patient relationship, professional responsibility, practical issues, and guideline format. Comparative analysis and synthesis revealed that GPs' reasons for not following guidelines differed according to whether the guideline in question was prescriptive, in that it encouraged a certain type of behaviour or treatment, or proscriptive, in that it discouraged certain treatments or behaviours. Conclusion Previous analyses of guidelines have focused on professional attitudes and organisational barriers to adherence. This synthesis suggests that the purpose of the guideline, whether its aims are prescriptive or proscriptive, may influence if and how guidelines are received and implemented. The present study was a systematic review and synthesis of qualitative studies of GPs' attitudes to and experiences with the use of clinical practice guidelines. While clinical practice guidelines have become prevalent, GPs' adherence to guidelines varies. Barriers to guideline implementation, including GP attitudes, have been identified, but qualitative studies have not been synthesised to explore what underpins these attitudes. This study indicates that GPs' attitudes to guidelines are systematically influenced by whether the guideline is prescriptive or proscriptive. This novel understanding can inform the development and implementation of clinical practice guidelines. that were published in either English, Spanish, or a Scandinavian language. Five electronic databases were searched: PubMed, CINAHL, EMBASE, Social Science Citation Index, and Science Citation Index, from their inception dates until November 2006. Search strategies were developed for each database in collaboration with a librarian and included each of the following categories: GPs, clinical practice guidelines, experience/attitudes and interviews/focus groups (Supplementary Table 1). All retrieved titles and abstracts were assessed along with independently-identified studies that fulfiled the selection criteria. Full-text versions of the chosen papers were independently assessed, and disagreements about inclusion were resolved through discussion. Studies were excluded if they were insufficiently focused on the topic, if the guidelines were assessed during the process of development and introduction, or where it was not possible to distinguish between data from primary healthcare physicians and other participants. Studies were also excluded if they used qualitative data-collection methods, but made no use of qualitative methods of analysis. Studies using mixed methods were eligible for inclusion provided it was possible to extract findings derived from qualitative research. Analysis used a broadly comparative case-study approach informed by tools and techniques outlined in the narrative synthesis framework.23 The selected studies were read and reread. Key themes and categories were identified, much as they would be in primary qualitative research. Searching for themes continued until all the studies were accounted for and no new themes were discerned. The definitions and boundaries of each of the emerging themes were discussed to see how these could be developed. The initial lists of themes and their dimensions were refined and used as the basis of charts (or matrices), derived from an approach described by Miles and Huberman,24 which allowed the themes to be displayed for a number of studies. These charts summarised key information about each study (author, date, country, study characteristics) and facilitated detailed comparison of each theme across the 12 studies. The charts underwent several revisions and further refinement and grouping of the themes until it was possible to synthesise the studies. Seventeen studies were identified that met the inclusion criteria, five of which were excluded following quality appraisal (Figure 1). The reason for these exclusions was the belief that the authors' findings were not consistent with or reflective of the data presented. The remaining 12 studies were published between 1998 and 2006,25–36 and were all published in English (Supplementary Table 2). Five of the studies were from the UK, while the remaining seven were from the US, Canada, and the Netherlands. The guidelines in these studies covered a variety of topics, including treatment, prevention, and screening, and mental and physical health, and they were related to adult, older, and child patients. Seven of the studies used focus groups, while five used interviews as their method of data collection. Most of the studies focused on barriers to GPs' use of guidelines, while some reported both negative and positive attitudes and experiences. Six broad themes were identified, which are described in Table 1. Quotes that are used were chosen because they expressed common interpretations by the authors. List of studies, extracted themes and findings; factors influencing clinical practice guideline (CPG) adherence. Some studies also referred to the guideline format as an important determinant of GPs' attitudes.25,27,28,32,34 There was some consensus that guidelines needed to be short and simple and include patient leaflets. Once key themes were identified, the next phase of the synthesis was to explore patterns in the distribution of these themes. This began by comparing and contrasting the themes against the country in which the study took place, the health issue, the method of data collection (focus groups or single interviews), and whether the study was about specific guidelines or guidelines in general. No systematic pattern connected to any of these traits was found. Scrutiny of the thematic tables suggested that one key factor was related to the nature of the guidelines: whether the guidelines encouraged or discouraged particular interventions or behaviours. Guidelines that encouraged the use of particular interventions were defined as prescriptive, while those that discouraged use were defined as proscriptive (Table 1). This distinction must be seen in relation to how guidelines influence current practice; that is, whether the clinicians are asked to perform new or more interventions or whether they are asked to reduce or end current activities. This classification was based on the authors' descriptions of the nature and purpose of the guidelines in relation to current practice. When this information was unavailable, the classification was based on implicit information in the findings about whether following the guideline in question would imply an increase or reduction in activities. Based on this information, it was found that there were five prescriptive guideline studies,26,28,30,33,36 and five proscriptive studies.25,29,31,32,34 Two studies were classified as mixed studies,27,35 as they investigated several different guidelines (Table 1). This study focuses on the thematic patterning according to this prescriptive and proscriptive distinction. In the prescriptive studies authors focus on the difficulties GPs experience when attempting to adapt recommendations to the circumstances of the individual patient and to the practical constraints of the consultation. In the proscriptive studies the focus is on the dilemmas of combining the role of gatekeeper and the role of patient advocate; such studies refer to GPs' concerns that rationing may harm the doctor–patient relationship or even lead to litigation. These patterns are clearly reflected in the charting of findings in Table 1. Two themes were exclusively found in proscriptive studies: ‘preserving the doctor–patient relationship’ (four of the five proscriptive studies), and ‘professional responsibility’ (four of the five proscriptive studies). Among the prescriptive studies, the theme entitled ‘practical issues’ was found in all of the studies, but it was found in only three of the proscriptive studies. The findings of this study suggest that GPs claim some reasons for not following guidelines more often than others. Concern for the individual patient's needs coupled with scepticism about applying research findings to individuals seem to be the most important arguments. This meta-synthesis also shows that there are different barriers to guideline implementation according to whether the guideline is prescriptive or proscriptive. The difference between prescriptive and proscriptive studies was most evident in the themes relating to the doctor–patient relationship and professional responsibility. Proscriptive guidelines may entail rationing and denial of patients' requests, thereby jeopardising the doctor–patient relationship. This dilemma has been noted and debated;45–52 studies reporting this dilemma note that such rationing is both unpleasant and in conflict with the ideals of a patient-centred medicine and the economic incentives of competition for patients. The focus of this study was confined to guideline adherence to ensure that there was a manageable number of comparable studies. As the aim of this study was to provide a synthesis that could complement studies assessing the effectiveness of guideline implementation, it was decided not to include studies of adjacent fields, such as GPs' attitudes to research evidence, or other health workers' attitudes to guidelines, although both of these fields of study have identified many of the same attitudes to implementation. Studies of low quality were also excluded. As noted previously, techniques for synthesising the findings of qualitative research are an emerging area of methodology. One field of discussion is whether and on what grounds studies should be excluded. Quality criteria vary in importance, but the failure by authors to show a clear connection or consistency between the primary data and the categories they have developed is a serious enough weakness to warrant exclusion. While the goal of this review was to investigate GPs' experiences and attitudes towards guidelines, most of the studies focused on barriers to their use. It is possible that other data may have emerged if these studies had focused on GPs' experiences in general, or on facilitators to the use of guidelines. It is worth noting that the distinction between proscriptive and prescriptive guidelines is not always clear or exclusive. For instance, guidelines recommending that patients who are using a particular medication switch to generic alternatives include rationing elements but possibly also innovative aspects as GPs and their patients are asked to try something that is perceived as new. Moreover, this study's categorisation of the guidelines is based on the way they are presented and interpreted in relation to current practice by the authors of the original papers. It was noted that information about how guidelines relate to current practice was lacking in several papers. Hopefully, the findings of the present study will prompt future authors to include such information. The included studies describe GPs' justifications of why they do or do not follow guidelines. It is not possible, of course, to be certain that these accounts are truthful or that they reflect behaviours. GPs may attempt to rationalise lack of adherence to prescribing guidelines,29 and there is some evidence that there may be a bias towards over-reporting adherence to guidelines.56 Nevertheless, understanding the different arguments put forward by GPs, and the important distinction between proscriptive and prescriptive guidelines may help in the future development of guidelines and implementation strategies. One limitation of narrative synthesis is that the quality of the synthesis depends on the quality of the included studies. Primary studies frequently offer insufficient information about the context of the study, including the interviewer's background and possible influence, and lack of reporting of the data. In this synthesis, a lack of information about the degree of structure in the interviews was also noted. It was frequently unclear whether the emerging barriers were results of free discussion or pre-presented categories. To overcome some of these limitations, studies were excluded if they did not demonstrate consistency between presented data and authors' interpretations. Notwithstanding the above limitations, the authors would argue that this meta-study offers a bigger picture than would be gained from reading any one study in isolation; the synthesis augments the qualitative research process through a formal and auditable process, and this disputes the relativist position that synthesis is not legitimate because it destroys the integrity of individual studies. Studies were deliberately chosen from a similar setting (general practice) and attention was paid to the context, participants, and clinical topic of each study, but it was not possible to extract findings of interest beyond the individual studies. The synthesis allowed a demonstration of patterns that would otherwise have been missed, and provides hypotheses for further investigation. GPs' attitudes towards guidelines appear to be similar across countries and health topics. However, this synthesis of qualitative literature suggests that GPs' attitudes to guidelines may be influenced by the purpose of the guidelines. Literature on diffusion of innovation is likely to be helpful in increasing adherence to prescriptive guidelines, but adherence to proscriptive guidelines also needs to be understood in terms of the doctor–patient relationship and could perhaps be best addressed using economic and psychological theory. While the challenges of face-to-face rationing as well as those arising from the introduction of new medical technologies have been highlighted, studies of guideline adherence have not taken into account the significance of different rhetoric used for prescriptive and proscriptive guidelines. Further research, for example, a subgroup analysis of the effects of interventions to promote the use of guidelines (such as the work of Grimshaw et al),1 may be able to detect behavioural differences that map onto these attitudinal findings. This paper provides an example of how qualitative studies can be synthesised, and a novel understanding of the barriers to the use of guidelines in general practice. Hopefully this will inform synthesis methodology as well as the future development of clinical practice guidelines. Revision received July 24, 2007. (2004) Effectiveness and efficiency of guideline dissemination and implementation strategies. Health Technol Assess 8(6):iii–iv. (1989) Do practice guidelines guide practice? The effect of a consensus statement on the practice of physicians. N Engl J Med 321(19):1306–1311. (2003) Factors influencing adherence to guidelines in general practice. Int J Technol Assess Health Care 19(3):546–554. (2005) Medical oncologists' perceptions of the effect of drug funding decisions for new cancer drugs on their practice: a qualitative study. J Clin Oncol 23(Suppl 16):6087. (2004) Selecting, presenting and delivering clinical guidelines: are there any ‘magic bullets’? Med J Aust 180(Suppl 6):S52–S54. (1998) Attributes of clinical guidelines that influence use of guidelines in general practice: observational study. BMJ 317(7162):858–861. (2001) General practitioners and clinical guidelines. East Afr Med J 78(1):30–34. (1995) Grey zones of clinical practice: some limits to evidence-based medicine. Lancet 345(8953):840–842. (2002) Identifying barriers to the use of research faced by public health physicians in Norway and developing an intervention to reduce them. J Health Serv Res Policy 7(1):10–18. (2004) Clinical practice guidelines' development and use in New Zealand: an evolving process. N Z Med J 117(1199):U999. (2002) Clinicians' attitudes to clinical practice guidelines: a systematic review. Med J Aust 177(9):502–506. (1997) Focus on qualitative methods. Qualitative metasynthesis: issues and techniques. Res Nurs Health 20(4):365–371. (1988) Meta-ethnography: synthesizing qualitative studies (Sage, Newbury Park, CA). (2003) Evaluating meta-ethnography: a synthesis of qualitative research on lay experiences of diabetes and diabetes care. Soc Sci Med 56(4):671–684. (2005) Patients' help-seeking experiences and delay in cancer presentation: a qualitative synthesis. Lancet 366(9488):825–831. (2004) Lay understanding of familial risk of common chronic diseases: a systematic review and synthesis of qualitative research. Ann Fam Med 2(6):583–594. (2006) Women exposed to intimate partner violence: expectations and experiences when they encounter health care professionals: a meta-analysis of qualitative studies. Arch Intern Med 166(1):22–37. (1994) A synthesis of qualitative research in wellness-illness. Qual Health Res 4(4):349–369. (2001) Meta-study of qualitative health research: a practical guide to meta-analysis and meta-synthesis (Sage, Thousand Oaks CA). (2002) Using meta ethnography to synthesise qualitative research: a worked example. J Health Serv Res Policy 7(4):209–215. Critical Appraisal Skills Programme (CASP) http://www.phru.nhs.uk/Pages/PHD/CASP.htm (accessed 7 Nov 2007). (2006) Guidance on the conduct of narrative synthesis in systematic reviews. A product from the ESRC methods programme (Institute of Health Research: ESRC Methods Program, Lancaster). (1994) Qualitative data analysis: an expanded sourcebook (Sage, London). (1999) Practice guidelines for clinical prevention: do patients, physicians and experts share common ground? Can Med Assoc J 161(5):519–523. (2001) Why do GPs not implement evidence-based guidelines? A descriptive study. Fam Pract 18(4):359–363. (1998) Use of guidelines in primary care — practitioners' perspectives. Fam Pract 15(2):105–111. (1998) Disseminating pediatric immunization recommendations: the physician's perspective. Ambul Child Health 4(3):265–276. (2003) The cost and cost-effectiveness of PPIs: GP perspectives and responses to a prescribing dilemma and their implications for the development of patient-centred healthcare. Eur J Gen Pract 9(4):126–133, 140. (2001) Asthma in primary care: making guidelines work. Can Respir J 8(Suppl A):29A–34A. (2001) Implementation barriers for general practice guidelines on low back pain, a qualitative study. Spine 26(15):E348–E353. (2004) Clinical guidelines on depression: a qualitative study of GPs' views. J Fam Pract 53(7):556–561. (2006) Urinary incontinence in the elderly: attitudes and experiences of general practitioners. A focus group study. Scand J Prim Health Care 24(1):56–61. (2001) Making decisions about cancer screening when the guidelines are unclear or conflicting. J Fam Pract 50(8):682–687. (2003) Assessing the awareness of and attitude to NICE guidance within GP partnerships in one PCO in Wales: a qualitative study using focus group interviews. Qual Prim Care 11(2):123–128. (2001) Why general practitioners do not implement evidence: qualitative study. BMJ 323(7321):1100–1102. (2002) Why general practitioners do not implement evidence. BMJ 324(7338):674. (2005) Implementing evidence-based medicine in general practice: a focus group based study. BMC Fam Pract 6:37. (2003) Research evidence and the individual patient. QJM 96(1):1–5. (1997) Evidence-based medicine: an incomplete method for informing treatment choices. Lancet 349(9045):126–128. (1999) Implementing findings of research revisited. Fam Pract 16(3):213–215. (2005) The nature of medical evidence and its inherent uncertainty for the clinical consultation: qualitative study. BMJ 330(7490):511–515. (2000) Use of exclusion criteria in selecting research subjects and its effect on the generalizability of alcohol treatment outcome studies. Am J Psychiatry 157(4):588–594. (1995) Dilemmas in rationing health care services: the case for implicit rationing. BMJ (Clin Res Ed) 310(6995):1655–1659. (1997) Muddling through elegantly: finding the proper balance in rationing. Health Aff (Millwood) 16(5):83–92. (1992) Factors which influence the decision whether or not to prescribe: the dilemma facing general practitioners. Br J Gen Pract 42(364):454–458. (1999) Shared decision making in a publicly funded health care system. BMJ 319(7212):725–726. (2004) Is patient involvement possible when decisions involve scarce resources? A qualitative study of decision-making in primary care. Soc Sci Med 59(1):93–102. (2000) Caring and cost: the challenge for physician advocacy. Ann Intern Med 133(2):148–153. (2002) Whose autonomy? Which choice? A study of GPs' attitudes towards patient autonomy in the management of low back pain. Fam Pract 19(2):140–145. (2005) ‘Saying no is no easy matter’ a qualitative study of competing concerns in rationing decisions in general practice. BMC Health Serv Res 5:70. (1995) The origins and development of the diffusion of innovations paradigm as an example of scientific growth. Sci Commun 16(3):242–273. (2004) A prospective and retrospective look at the diffusion model. J Health Commun 9(Suppl 1):13–19. (1999) Evidence of self-report bias in assessing adherence to guidelines. Int J Qual Health Care 11(3):187–192.